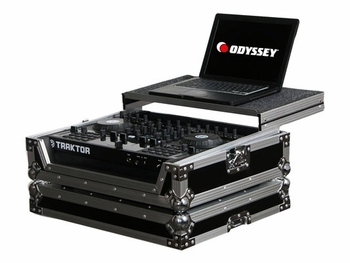 Odyssey FZGSTKS4 Traktor Kontrol S4 / American Audio VMS4 Flight Case DJParts - All Variety of Parts that DJ Needs. The Odyssey Flight Zone® FZGSTKS4 case is specially made for the Traktor Kontrol S4 DJ midi digital controller and can also fit the American Audio VMS4 DJ controller as well. It features our patented Glide Style™ laptop platform that slides foward and backwards over the control unit to whatever position best suits you. Also features a lower storage/ventilation pit that has enough room for cables and other compact DJ essentials.